Bentley's Road & Track Illustrated Automotive Dictionary is an easy-to-use resource that answers automotive-related questions. This book's listings are arranged alphabetically and fully illustrated, which will help take the frustration out of decoding sales brochures, make sense of info downloaded from the Internet, and more. More than two decades ago, author John Dinkel gave tens of thousands of auto journalists, enthusiasts, and car owners the most comprehensive automotive reference of its time. Now, Dinkel has revised and updated that original work to include current advances in technology, and created a new standard in automotive reference guides. This book will become the first resource you turn to when you need an answer to any automotive-related question. L-Jetronic - A Bosch-developed gasoline engine fuel injection system in which fuel is metered to the engine by electronically controlling the amount of time that the fuel injectors are open. Also know as a pulsed injection system. Ladder frame - A chassis constructed with two heavy-section longitudinal members connected by smaller transverse members. Comparatively heavy and generally lacking in torsional rigidity, the design is now uncommon, except in truck and some SUVs. Laminar flow - Smooth airflow over a surface, such as an automobile body. Also, inside an engine, the smooth flow of the air-fuel mixture through the intake manifold and ports. In laminar flow all portions of the airstream are essentially parallel, and their relative velocities are fairly constant. Laminated glass - A thin layer of rubbery plastic sandwiched between two sheets of glass. Laminated windshields are required on cars sold in the United States. It is safer than toughened (tempered) glass because damage, unless extensive, is localized and generally won't seriously impair vision. When struck by a large blunt object, a laminated windshield bows without puncturing, and its plastic interlayer holds the glass and prevents it from splintering. Also see safety glass. Lash - Clearance or play between two parts. Also see valve clearance. 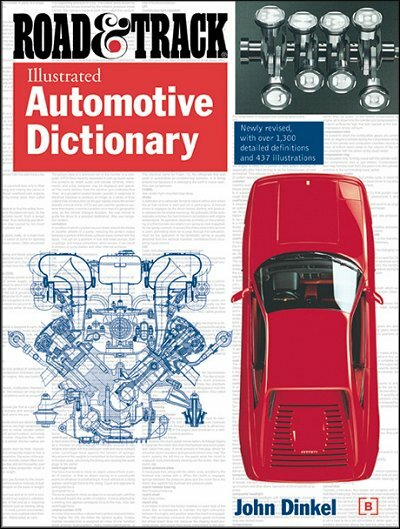 Ask a question about Road & Track Illustrated Automotive Dictionary.